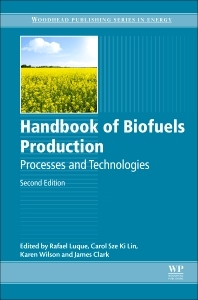 Key changes for this second edition include increased coverage of emerging feedstocks, including microalgae, more emphasis on by-product valorization for biofuels’ production, additional chapters on emerging biofuel production methods, and discussion of the emissions associated with biofuel use in engines. The editorial team is strengthened by the addition of two extra members, and a number of new contributors have been invited to work with authors from the first edition to revise existing chapters, thus offering fresh perspectives. Prof. Karen Wilson is Chair of Catalysis and Research Director of the European Bioenergy Research Institute (EBRI). Prof James Clark is a founding director of the world-leading Green Chemistry Centre of Excellence at the University of York, UK.